David France a first time filmmaker and award winning journalist who covered the AIDS crisis for 30 years for the gay press then later for other like the New York Times and Newsweek. 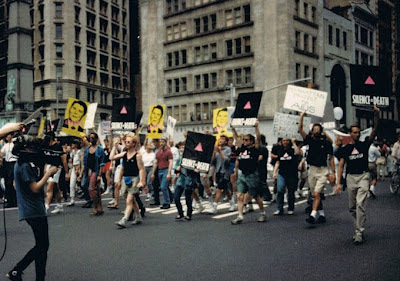 Using archival footage from over 30 videographers from the activist group ACT UP in Greenwich Village that used testimonials from the protesters themselves. France who says the film is more of a tribute than a documentary has structured a linear story from start to finish following the key characters as they age, sicken and die while fighting for the cure. The film has been touring various festivals including winning awards at the 2012 Sundance Film Festival. In 1981 there were 40 AIDS cases reported. By 1995 over 8 million victims had died from the deadly auto immune disease that has so far eluded eradication. In the mid 1980's the gay and lesbian group in the New York gathered to find a way to motivate the powers that be that they should be putting more effort into the treatment of AIDS which was death sentence for anyone being diagnosed as HIV positive. ACT UP's peaceful civil disobedient demonstrations targeted drug companies, government and the scientific community which to this point were not focused on the growing problem. The inertia was severely disrupted by the aggressive theatrics and assault on public figures. The film shows how the main government big wigs like President Bush, Sr and NY mayor Ed Koch were too busy giving lip service instead of actual service. Religious leaders like The Pope and NY archbishop John Cardinal O'Connor towed the homosexuals are bad line along with Jesse Helm who ranted that the gay community was getting what they deserved. Not everyone who was fighting for the cure was gay. A straight housewife who was a retired scientist consulted with the group showing them that knowledge is power. ACT UP created a team that would educate themselves to work with the drug companies to speed up drug trials to get the drugs on the market right away. The drug AZT which later turned out to be not only ineffectual, but cost prohibitive and hard to absorb, was followed by others which ACT UP managed to help be released, still it was not plugging the dam. Most of the key members of the movement didn't believe that they would live long enough to see a cure. This film is not only a good lesson on direct political action by the citizens, but it also touches on the lives that were deeply affected by the “plague”. It shows the excitement the community had in each little moment of triumph, then later stymied from the frustration and infighting over the years of not being able to progress as their numbers die along the way. The introduction of a new triple drug regiment was finally discovered that cut the numbers of deaths by 50% quieted the movement. But AIDS is still with us, it's still killing people who can't afford the treatment. Work still needs to be done. No one really wants to hear about AIDS anymore, but hopefully this film will be seen and should be seen so that we never forget.